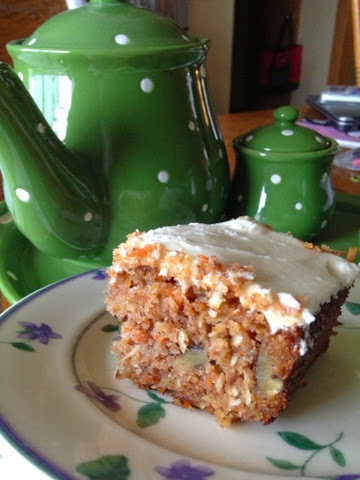 I was given a recipe over 20 years ago for carrot cake. At the time I was in grad school and was not doing a lot of baking. I have kept the recipe all this time, and once a year it is pulled out and baked for my dear ole dad. This is not the cheapest cake. This cake does take a little more time to prep, bake and frost. However, this is likely to be the best carrot cake you will ever (and I mean ever) make. Then bake in a 350 degree oven 45 minutes-60 minutes for a 9 in by 13 in cake. Be sure to test center of cake for doneness. Beat until smooth. Keep refrigerated. I like to enjoy with a hot cup of tea or a cold glass of milk. Enjoy with friends and family.